Renowned actress Waheeda Rehman will be conferred with the Centenary Award for Indian Film Personality of the Year at the International Film Festival of India 2013 in Panjim, Goa. The 2013 edition of the Festival is being held between 20th to 30th November. The award has been instituted to commemorate 100 years of Indian Cinema, and will be given annually to an outstanding film personality for his or her contribution to Indian cinema. 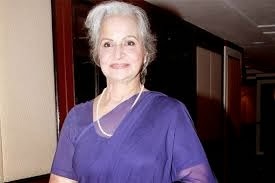 After extensive deliberations, a five member jury identified WaheedaRehman as the ideal member of the Indian film fraternity to be the first recipient of the award. The Centenary Award recognizes her prolific body of work through the film industry’s formative years. The award carries a citation, a certificate, amedal(Silver Peacock),a shawl and a cash prize of Rs.10 lacs. Ms. Rehman is considered to be one of the most prominent actresses of the "golden era" of Indian cinema, as well as a classic Bollywood beauty. The protege of film making icon Guru Dutt, she is known for her roles in critically acclaimed movies like `C.I.D.`, `Pyaasa`, `Kaagaz Ke Phool`, ‘Sahib Bibi aur Ghulam’, ‘Teesri Kasam’, ‘Mujhe Jeene Do’, “Reshma aur Shera” and `Khamoshi`. Waheeda Rehman was theperfect match in terms of histrionics for the king of acting Dilip Kumar, and together they delivered some outstanding films like `Ram aur Shyam`, `Dil Diya Dard Liya`,and `Aadmi` . Of note is Waheeda`s on-screen chemistry with Dev Anand in several highly entertaining films, including ‘Guide’, which won her a Filmfare Best Actress Award for a flawless performance as Rosy, the dancer. This film also did justice toWaheeda’s dancing skills ,and saw her deliver an exceptional “Sapera” dance sequence which is remembered till date for its unmatched joie de vivre’. Organized by the International Film Festival of India (IFFI) Secretariat under the aegis of the Ministry of Information and Broadcasting, Government of India, in collaboration with the Government of Goa and the Indian film industry, IFFI brings cinema from around the world to India, and presents a bouquet of contemporary and classic cinema from India to the world, through film screenings, academic sessions and cultural exchange programmes. The festival will be visited by renowned cinema personalities, including Academy Award-winning Hollywood actor Susan Sarandon, critically acclaimed Iranian director, producer and screenwriter Majid Majidi, and Polish filmmakerAgnieszka Holland. The Indian celebrity delegation includes veteran actress Rekha, legendary singer Asha Bhonsle, actor-filmmaker Kamal Haasan, and renowned actorManoj Kumar. Films screened at the festival include a curated selection of the the works of iconic film personalities, documentaries, homages and tributes to cinematic legends as a showcase of changing trends and aesthetics.